and pool packages please call 020 8778 6888. The Slidaway provides the ultimate swimming pool enclosures for all seasons enabling complete open air or enclosed use within a matter of minutes. Constructed from high quality aluminium,the Slidaway swimming pool covers are the answer to the perennial question - ' Outdoor or Indoor Pool' Slidaway is both! Our enclosure extends the swimming season and will keep you warm even when it’s raining outside! All structures are durable and only made out of the finest materials. 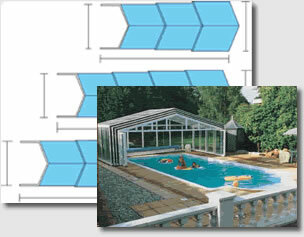 We can design, manufacture and install the swimming pool enclosures from start to finish. The swimming pool enclosure is a smart, cost effective solution. Our installation service is nationwide throughout the UK and Ireland, and our package plans include swimming pools too. We'll be happy to explain the finer details of Slidaway swimming pool enclosures and covers and arrange for a site visit. The structural frames are built to 6063-T6 to BS1474 specification. Three colours are available including white as standard or green and brown at additional cost.